It is quite the dreary day for little Bernice as she attends a birthday party. Everyone else had gotten a frosting rose on their piece of cake... but not Bernice. All she'd gotten was a plain white square from the middle. But an unexpected event leads Bernice to change her perspective and it turns her whole attitude around. 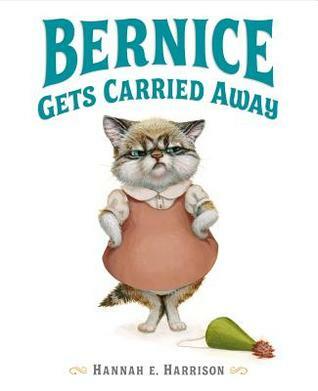 Bernice Gets Carried Away is a marvelous book to share with kids to show them how one person's kindness and change of attitude can have a ripple effect on everyone around you. Hannah E. Harrison is a very special illustrator. Her ability to anthropomorphize animals with such expression and affection makes you want to reach in and hug every character she creates. After I read and wept openly at the end of Extraordinary Jane, I have vowed to read everything Harrison publishes. 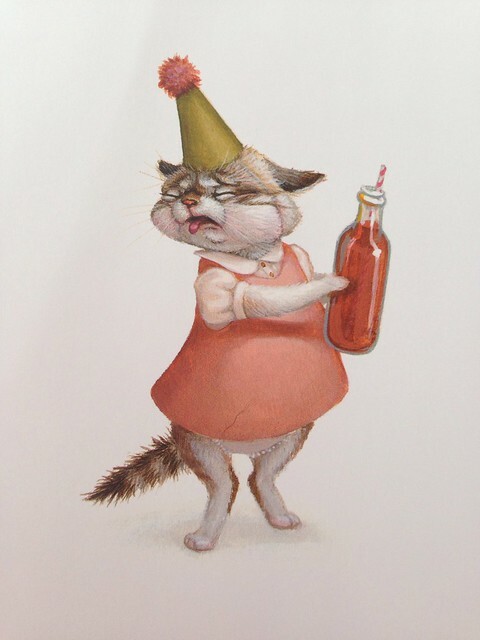 And how can you not love an illustrator who makes even the grumpiest of cats one you want to snuggle? Warm prune grapefruit soda, anyone?